Our Alexander Wang girl was the ultimate gothic Valentines. 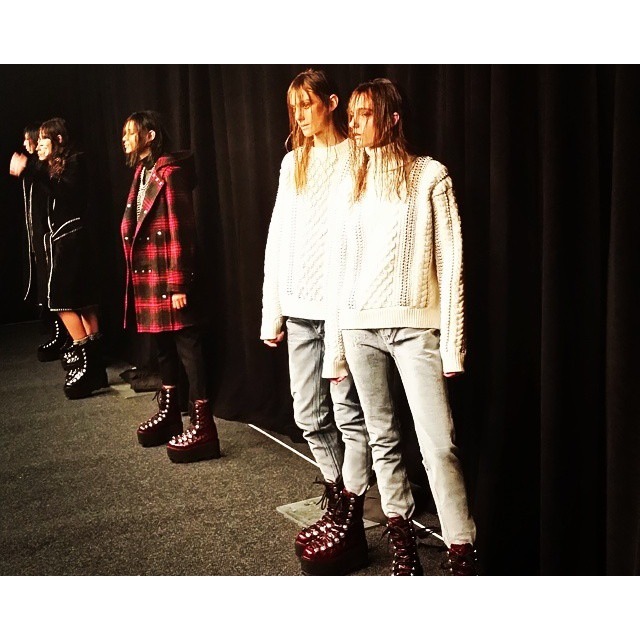 She wore denim, cable knits and snow boots to reflect on the Autumn Winter 2015 season. What you’ll be seeing and wearing come fall has nothing to do with the bright lights or the famous faces who rushed out the back door before paparazzi could snap their photos. It’s the little things that make Wang’s collections so attention-grabbing, so coveted, so copied. And, this time, the detail that will stick (among others) is the multi-button blazer. Tiny silver baubles shone amidst the mostly black (on-black-on-black) collection, which was, overall, tough and rocker in nature. This entry was posted in Trend Reports and tagged Alexander Wang, fashion blog, New York Fashion Week, nyfw. Bookmark the permalink.